"How can I make money blogging?" That's the question I kept asking myself. Over the last few months I finally started earning an income as a blogger & digital influencer. Nope, it's not enough to quit my social media coordinator position, but it's enough to help pay the bills, buy plane tickets to Paris, save money, & truly enjoy life. 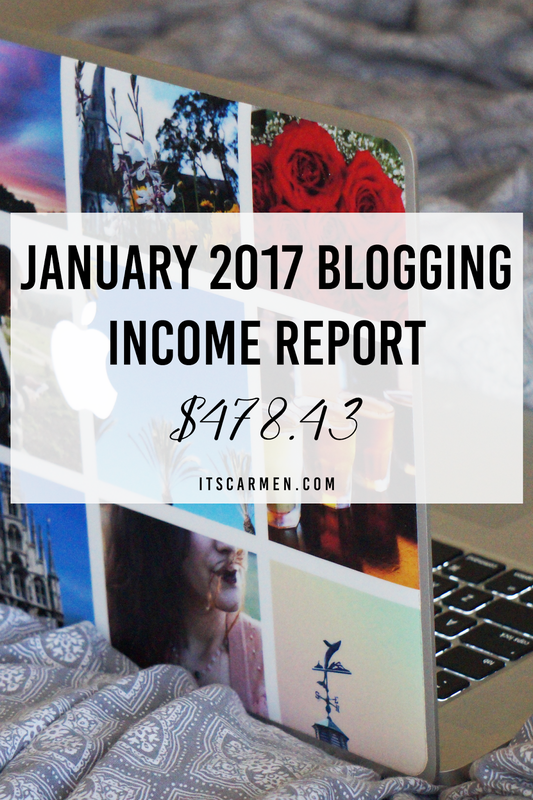 You might be wondering how you can make money from blogging, so here's my January 2017 Blogging Income Report. This is my first income report, but I earned over $800 in December 2016. Note: I base my income report on earnings that were deposited into my bank account during that month. I did several projects in January that have yet to be paid out, therefore I will take that into account for my February Income Report. The only exception to this rule is the $15.43 from ShopStyle Collective. I only get paid once I make the $100 threshold but thought it'd be misleading to post that I earned $100 from ShopStyle when in fact that was many, many months in the making. Most of my blog earnings were from sponsored blog posts & sponsored social media posts. I'm working on growing my following & engagement, so it's nice to be rewarded by getting paid opportunities. I worked with brands like Truvia & Lays. I even was a part of the promotional team for a new show on FX called Taboo. Thank you for being open about your blogging income. It's nice to get a realistic scope. I'm starting blogging more frequently this year and hope to be blogging more "full-time" once my little one is born, since I'll be home. So cool! that is a nice blogging income. Inspired me to work harder to do sponsored posts. I love seeing the breakdown and where the income is coming from. i definitely will need to look into sponsored posts and how to even get sponsors! Really awesome to see the breakdown of how you are generating income via blogging. Super inspiring and insightful! Thanks for sharing! So neat to see how your income from blogging is broken down. Thanks for sharing. I love blogger's income reports. They're so interesting. You did so well! Yay! I can't wait to read your other post on this subject! Your post has inspired me . Thanks. Pretty brave to reveal your income. I go back and forth about revealing mine but you've pushed me a little closer to doing it. Thanks for sharing and keep up the good work! It really is so rewarding to make money on the hard work behind the blog! You are killing it! WAy to go girl! I love making money blogging. I don't make as much as you though. :) You're killing it! Thank you for sharing this. As a new blogger having this broken down for me is great ! You go girl! I love that you're so transparent in your earnings and I know this will motivate other bloggers to turn their hobby into a business! You go girl! Reading income reports is my jam. it is great you're transparent about this. Mine too! Wish there were more!